While the challenges facing the trucking industry may vary from year to year, the one consistency is that companies managing private and/or dedicated transportation fleets are being forced to do more with less. Following the ever-increasing need to improve efficiencies, the digitization of the supply chain proved to have a substantial impact on the efficiency and flow of freight operations in 2018. As we review our predictions from last year, it’s safe to say most of them held true. Data sharing and open access, the onset of APIs, instant pricing + booking, and technologies such as machine learning have made all the difference in getting the most out of finite transportation resources. For 2019 we expect even more pervasive digitization than last year, ultimately driving towards a more unified experience for shippers and carriers alike. For its strong overall performance, Loadsmart earned Frost & Sullivan’s 2018 Company of the Year Award – Automated On-demand Freight Brokerage. What better way to start off the year? To be recognized as an industry leader Loadsmart had to demonstrate excellence in growth, innovation, and leadership. Based on Frost & Sullivan’s key business performance categories such as visionary innovation, and performance and customer impact, we earned a solid nine, putting us well above the other evaluated companies. No doubt 2019 will be an interesting year and we can’t wait to see what it has in store. Recently, our vice president of operations, Erik Malin, spoke with the “Logistics of Logistics” podcast host, Joe Lynch. Joe interviews senior level 3PL providers and business professionals in the logistics and transportation industry. In this episode, Erik and Joe discussed how innovative technologies such as artificial intelligence (AI) are changing the freight brokerage space. The two also talked about Loadsmart’s dedication to its customers, and how the company’s use of strategic partnerships has made it a leader in the industry. New York, NY, Loadsmart, a technology company that specializes in full truckload shipping, was named by Gartner as a Cool Vendor in Intelligent Supply Chain Execution Technologies. Loadsmart was recognized as one of five companies providing emerging supply chain execution technologies. Over the last five years, Loadsmart has been focused on helping shippers and carriers execute their truckload shipments in a much more efficient manner. This effort includes creating better experiences for both parties, as well as improving and automating back-office processes to reduce internal costs and provide better rates to all involved. Recent innovations include fully-automated server to server truckload booking (without human intervention) capability, accepting 100 percent of tenders and guaranteeing capacity; a load management mobile app for its internal team; and a tool to auto-classify shipment documents (BOL, invoices, POD, etc.) with machine learning technology. The prestigious industry research company CB Insights has selected Loadsmart as one of the startups disrupting the supply chain and logistics industry. 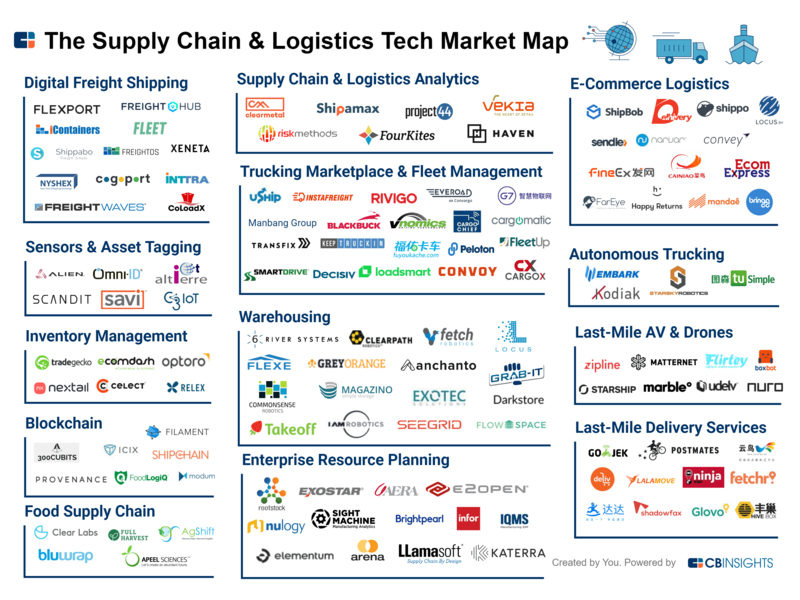 In its brief called From Tracking Food To Last-Mile Delivery, 125+ Startups Disrupting The Supply Chain & Logistics Industry, Loadsmart is mentioned in the ‘Trucking Marketplace & Fleet Management’ category. We couldn’t be here without the hard work of our whole team. Felipe Capella is Loadsmart’s Co-founder and Chief of Product. On May 15, 2018, we wrote about the first fully automated intelligent routing guide with dynamic rates in the US. That powerful tool enables shippers to automatically book a truck before the shipment turns into a spot load and has reduced spot volume for Fortune500 Shippers by as much as 50 percent. Loadsmart accepts 100 percent of tenders received from the dynamic routing guide, guaranteeing capacity. This feature helps shippers avoid the same-day/next-day markets, which are known for steep prices and service failures. Given the huge interest and questions we got from the logistics community, we decided to expand and explain the reasoning behind it and how it actually works in a granular way. Guarantee capacity for all of those auto-accepted tenders. This explains how we went from participating in a daily spot auction via email to a full-fledged integration with our customer to reduce spot volume. Loadsmart was invited to speak at the Supply Chain Conference organized by the publication Automotive Logistics in Atlanta. In a panel titled “Clearing the bottlenecks”, Ricardo Salgado, Loadsmart’s CEO, and Ivan Hernandez, Daimler’s Director of Transportation for North America, co-presented a joint project which leveraged Loadsmart’s technology. The project successfully reduced Daimler’s time to execute a spot load from 5 hours to 18 minutes, while increasing Daimler utilization of their carrier customers by 70%. Aside from Loadsmart and Daimler, the other panelists came from Honda, Toyota, Surgere, and Ryder. Over the last five years, we have been obsessed with introducing new technology to dramatically improve the efficiency of the freight brokerage business. This effort not only includes creating a better experiences for shippers and carriers, but also improving and automating back-office processes. Every broker receives thousands of documents per month related to ongoing and delivered shipments: Rate Confirmations, BOLs, PODs, Invoices, etc. Identifying, separating, cataloging and uploading each document to the right place takes countless hours, and even the most strict processes result in a non-negligible error rate. The new feature we just released is a machine learning model that analyzes each email, its attachments, and identifies what documents are contained into a single or multiple PDF files. After automatically scanning and cataloging the content of the files, the system then splits the documents into its component sub-files (e.g. BOLs, Invoices, Rate Confirmations, etc.) and auto-uploads each document to the right shipment folder. This new feature is saving hundreds of hours per month in document review, and it has dramatically reduced the error rate in classifying documents. The more automated and efficient we are, the lower operational costs we have, which in turn has meant we offer more attractive prices for shippers and better margins for carriers. Erica E. Phillips, supply chain reporter for WSJ Logistics Report, writes that the hiring binge for logistics and freight companies may only be just beginning. The sector added 18,700 jobs last month, giving transport and logistics operations 73,000 new jobs since the start of the year. Companies are scrambling to keep up with surging shipping demand in what they say is the hottest transportation jobs market in several years. While positive news, the peak shipping season is not here yet. How can we support manufacturers and retailers, and ensure they can fulfil their supply chain? The digital supply chain is being hailed as the way forward, yet this comes with its own set of challenges. Virginia Howard, research director, Supply Chain Research Group, Gartner, correctly notes that digital technologies are enabling and promoting changes that have a larger impact, greater unpredictability and increased frequency. And that now, more than ever, high-tech supply chains require digital skills and methods to deliver customer-driven solutions in an on-demand fashion. If everyone is going to be confronted by disruption in the marketplace, how can manufacturers and retailers choose technologies that will bring real ROI? On Thursday, June 7 at 11:45 am, Erik Malin, Loadsmart head of operations, will join fellow panel members from BCG Logistics Group, DHL Supply Chain, Kenco Innovation Labs at the 3PL & Supply Chain Summit: Atlanta. During the logistics technology stream, Erik will discuss how data and technology has empowered manufacturers and retailers alike – and how it is very different from mere automation. Email us if you want to meet the Loadsmart team at the summit or if you want to learn more.